1/7/12 UPDATE: Sadly, PrizeLive is shutting down and merging with it's sister site. The minimum payout has been lowered to $0.01 and Game Credits can be converted to cash, so that everyone can withdraw their earnings. The site will be online up until March, so if you have an account, be sure to cash out as soon as possible. This is the newest GPT I joined and I am liking it so far. They have a very low minimum payout of $1 Paypal/Payza. They also have gift cards including an Amazon and GoDaddy gift card. What I like about this site is that once you complete an offer and click submit, it automatically credits unlike some sites which take longer. They have a lot of of PTCs (Paid to Click), that you can complete daily. There are over 4 pages worth of PTCs. I love how quickly it credits and there are LOTS of freebie offers like quizzes and PTCs. They credit in points and 1 point = $1. You can reach the minimum payout in a day if you do the offers. This is an overall great GPT site with a very low payout. If you want make a quick buck (literally), then check out this site by clicking the banner above. * N/A - I haven't seen any yet! It took me about 2 hours to reach the minimum Paypal cashout. The first cashout is manually verified and takes up to 48 hours and then the rest are instant! It's very easy to reach the minimum $1. They also have custom orders! 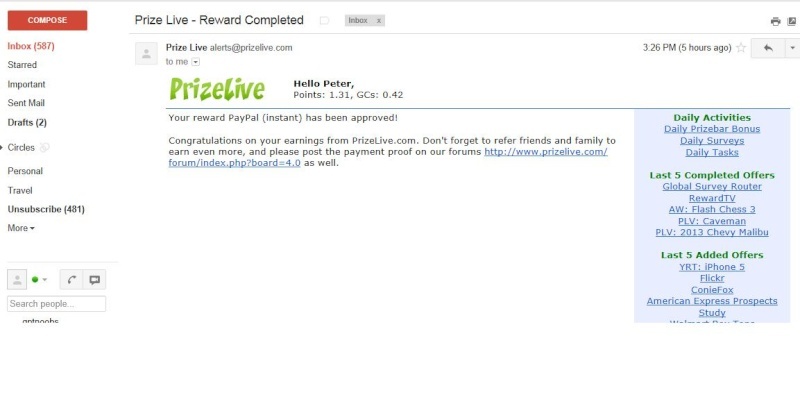 I have gotten a bunch of Paypal cash from PrizeLive! Here is my latest instant Paypal payment. This is definitely one of my favorite GPTs! It is one of the easiest ways that you can get Paypal. Please sign up with the banner above! Trust me, you will love this site. * Do the quiz offers each day. You will need a unique email address so you will probably need to make some. * Try all of the daily surveys. Go down the list. * DO THE PTC DAILY! This is the easiest way to earn. It will get you about 0.11 points a day. * Do the daily offer each day. You can get either 0.25 GC or 0.05 points. * Do the easy, sign up offers. That's another way to earn without much effort. * Do the forum and blog offers. These may only be completed once. You will have to start a forum thread and copy and paste what they have to your post. (Don't do it here!) Then, you will need to create a blog talking about the site. These are manually approved and you will have to send in the link. They each credit 0.50 points, so that is a dollar if you do both of them. ($1 is the minimum to cashout) These are also relatively easy to do and won't take much effort.